Just took the Adorable Monster out for his morning jaunt and fed him his kibble (poor thing doesn't eat human food). I may hit the farmer's market this morning and maybe do a little shopping with some friends. Dinner is still up in the air—any suggestions? Was thinking of maybe making mussels and fries. Yum yum yum. 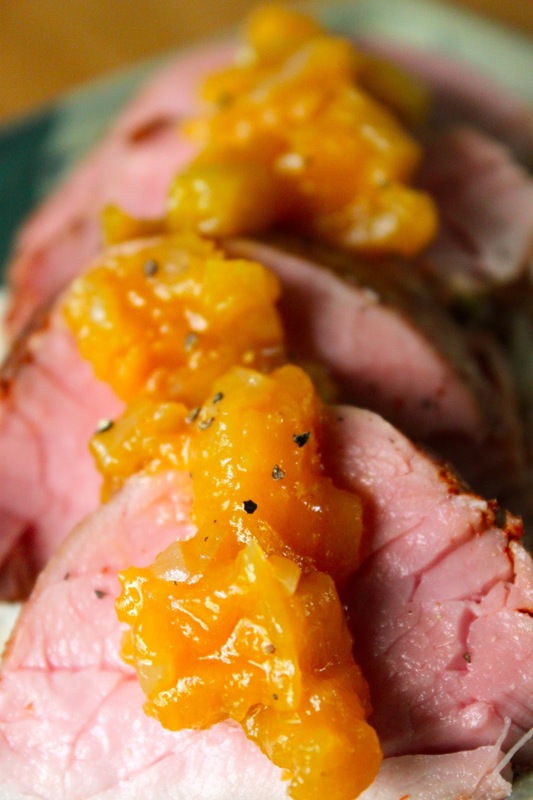 In the meantime, here's one of my favorite sous vide recipes I've made using my Sous Vide Supreme—Chili-Rubbed Pork Tenderloin. This dish was inspired by the restaurant Salt's Cure in Los Anegeles, which does a killer chili-rubbed braised pork shoulder over stone ground grits. I decided to cook a version of it with pork tenderloin and cooked sous vide, although this recipe could easily be made with conventional cooking methods as well. I served it with an Apple-Ginger Relish (recipe here) and over stone ground grits. It can be plated individually, or served family style as I did for New Year's Eve. 1. Fill the Sous Vide Supreme with water and preheat to 135-140 degrees, depending on desired degree of doneness (135 = medium rare and my preference, 140 = medium). 2. Meanwhile, rub the pork chops with the chili powder, salt, and pepper. Place each piece of pork tenderloin into a separate plastic bag with a pat of better. Vacuum seal both bags. 3. Once the Sous Vide Supreme has reached the proper temperature (hint—filling it up with hot water will help it heat up faster), place the pork tenderloin bags in the water bath, making sure that the meat is submerged and that the bags are not touching each other. Cook the pork tenderloin in the Sous Vide Supreme for about two hours to reach pasteurization (though it can stay in longer). 4. Remove the pork tenderloin from the Sous Vide Supreme and cut open the bags to remove the meat. In a saute pan, heat the grapeseed oil over medium-high heat. Quickly, sear the pork tenderloin on all sides until nicely caramelized (about 1 minute per side). Remove from the pan and allow to rest for 5 minutes before slicing. 5. To plate, layer the slices and top with the Apple-Ginger Relish. Enjoy! Let me start by saying that I have tons of great recipes to write up, already cooked, already photographed. Let me continue by saying that I'm crunched for time right now. It's a high class problem. My agents LOVE my new book. That's super duper awesome. It means that my novel will be going on submission to publishers (it's young adult science fiction in case you're curious). I'm very proud of the book and hope it will find a great home. It's also responsible for my time crunch. My agents gave me a set of notes, so I'm working hard to turn around revisions in a timely manner. Adding to the pile, we've just attached a director to my romantic comedy script. So right after the book, I'll be rolling right into revisions on that project. Like I said—a high class problem. You can read more about my fiction and TV/film endeavors on my author website here. I promise to get back to posting recipes on a regular schedule soon (and I have hundreds of recipes in my archives). 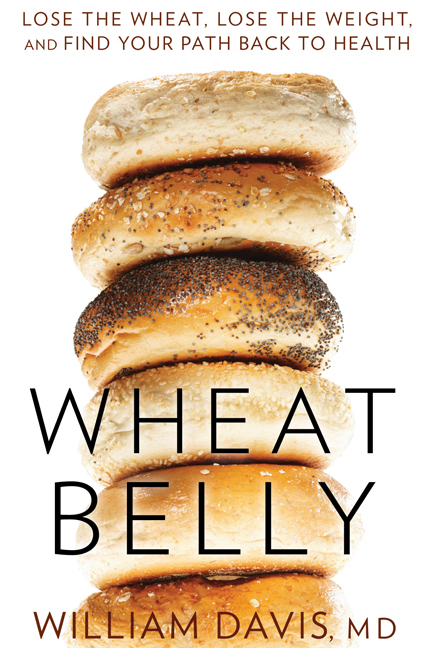 In the meantime, I thought I'd share this book that's rocking my world—WHEAT BELLY by William Davis, MD. I suspect that I harbor a wheat intolerance (and that's the reason why this blog is largely gluten-free, with some exceptions that can easily be adapted). But recently, I'd allowed wheat (mostly in it's whole grain form) to creep back into my diet. It happened slowly and then suddenly, and I've found myself with health problems that I used to experience back in my wheat-eating days (sinus issues, fatigue, insomnia, etc.). Now I can't say definitively that they're caused by wheat, but I'm going back on a strict gluten-free regimen to see if it helps. While pursuing that, I came across this bestelling book and picked it up. 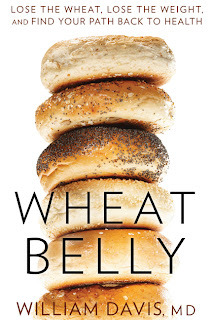 The author makes the argument that the genetically-altered strain of wheat that we call "modern" wheat has crept into almost every aspect of the American diet and causes a litany of health problems, most notably the obesity he calls "wheat belly." Of course, I've known this for years, but he puts the pieces together with a well-researched history of wheat. I also learned that whole wheat bread is just as high on the glycemic index as white bread, and even HIGHER than sugar. Uh, what?! Of course, there's a lot of nuance to the argument, but the proof is in the pudding. The author is a cardiologist who notes that when his patients go on a wheat-free diet, they lose weight, their blood pressure and blood sugar go back to normal levels, and they can get off their medications. He also has a blog that many people like—Wheat Belly Blog. I'll report back on my GF experiment. And here's the link to the book if you'd like to purchase it from Amazon.